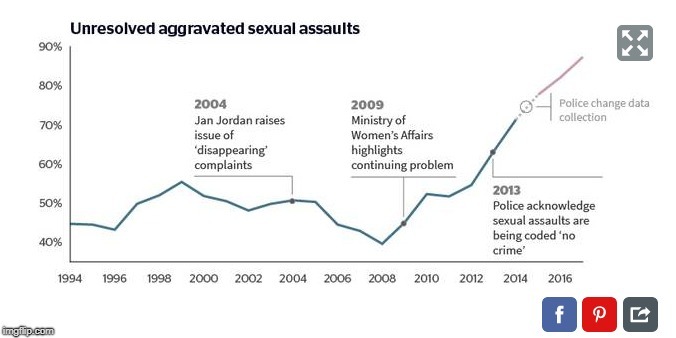 sorry about that Chief…who’s tough on crime…revealing graph..
Yeah I read that. I guess they’re finding it hard for content at this time of year if they’re regurgitating old news. I am at the moment with my 5 weeks free sample, but won’t miss it when the 5 weeks are up, except for the cryptic crossword. Apart from anything else, I am tired of having all that paper to haul out; I don’t read the sports, business and houses, and they go straight into the green bin. A man I worked with said that they were too poor to buy dunny paper when he was a child, so they used the Auckland Star. He is really special, a real star. No wonder you love him. I had Fido’s photo put on my eftpos card and use his real name as a password. No worries. Just robert, rabbitting on as usual. Grandies might’ve gone home & he’s got no one of the same mental age to play with at home maybe. He can be very entertaining, unlike the longest resident troll who is a bullshitting bore, and I have my own theory about why he is often anything but. Are you thinking the same thing, Gezza ? I find the pair of you quite entertaining, to be honest. No, PG had it right. This vendetta has gone on too long. Time to end the stalking and fixation. How did it go so wrong for Labour from 2008 till 2017? Phil over the hill Goff, David Who? Shearer, David I will storm to the greatest victory ever “Cunliffe andAndrew I’m an angry union man Little. And if it weren’t for the enigmatic maverick chameleon waka jumper Mr Peters Jacinda Adern could/should have been the 5th Labour no show leader. Where were the Labour party image consultants? The spin doctors the smear campaign experts? Third term National Governments are usually so easy to describe as being a bunch of rich old capitalists raking it in while the ordinary Kiwi struggles.So why did Labour fail to romp home but instead allow an old Bill English to stroll to victory? Spin doctors and smear campaign masters needed at Labour HQ immediately. Female tv and print media journos manufactured a personality cult around Jacinda because she’s a girl, like them. Up until then she had done nothing and achieved nothing. If it wasn’t for Winston Peters seizing the opportunity to exploit Labour’s malleability (he would’ve figured out on the first day of coalition negotiations they had bugger-all policy to speak of, & no idea how to implement the few policies like Kiwibuild that they had announced) Jacinda would just be the leader of Labour Opposition. Her background is a Comms degree so she will have studied PR, image management and spin doctoring & is actually good at it, so any advisers they are using are already talking to someone who can evaluate them with a reasonable degree of knowledge. She’s an accidental PM really. A manufactured one like the Monkeys were a manufactured group. The Monkeys turned out to have some actual real musical talent. Now we have to see if Jacinda has what it takes to develop into a proper PM in her own right. Funny how your response to failure is simply to insist on more spinning, more smearing, and not look at the actual policies or people. Ma and I got caught up in a traffic jam on the way home from Welly Hospital – the chap up top there at the site of a car accident that closed the Terrace Tunnel there is bleeding and has a knife. 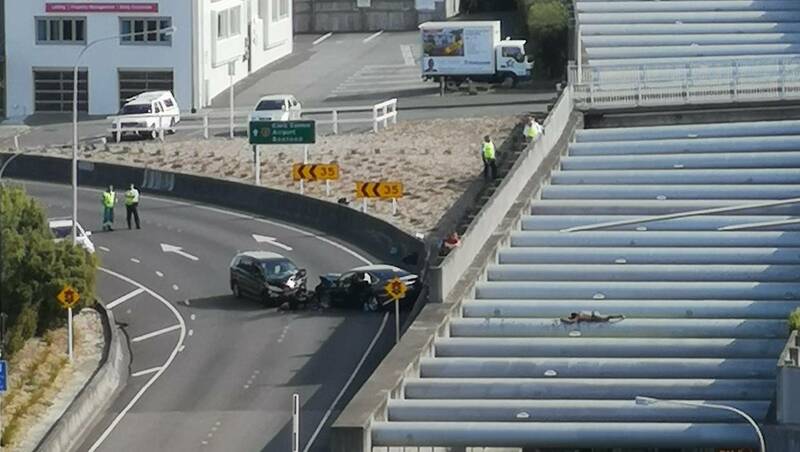 A two-car crash that has forced the closure of the main route in and out of Wellington city was reportedly caused by a man driving the wrong way into incoming traffic. And witnesses say after the impact he got out of his car wielding a large knife. Or possibly Treasury across the road? Three Wellington double-decker buses have been brought in to help remove the man who scaled pipes above an entrance to the Terrace tunnel on State Highway 1. As at 7.30pm, the man had been above the tunnel for seven hours. The country’s main highway remains closed seven hours after the man, who had a knife, climbed above the road following a crash near the tunnel on Thursday. Any updates on ZB, Lurchy? Don’t think it’s over. Herald and Stuff not showing any breaking news. Followed by some moron named Kelvin saying they should just shoot him in the leg and when he falls off onto the road just have an ambulance waiting & off they go. Mrs Al would be with Kevin on that. Short shrift there. That drop would very likely kill him, Al. It’s about 3 stories up. Yep, realise that. I think he’s cost more than a human life is worth already. Shoot him and put the money saved to better use. Man perched over a Wellington motorway refuses aid, and police say it could go through the night. Must admit you’d think someone would’ve figured out a non-lethal solution by now. Set up nets below or something. Inspector says he was not being pursued by police. People in the other vehicle he hit suffered moderate injuries and were taken to hospital. They want to resolve this without anybody getting hurt. the buses are there to reduce the drop space. He could be up there all night, but they hope he will eventually come down himself. Asks Wellingtonians to be patient. I guess it’s only Welly so what does closing SH1 and probably causing thousands of people to miss their planes and appointments matter? He’ll probably nod off and fall off anf kill himself anyway. Nah, they’ll just have diverted traffic round to Aotea Quay and either round the bays (nice scenic drive) or around via Kent & Cambridge Terrace. They probably haven’t needed to block off any side streets. It’s only the tunnel that’s blocked I expect. Traffic could still access The Terrace as although it’s called the Terrace Tunnel, it’s adjacent to it on the motorway. Be interesting to see how long he manages to stay up there though. 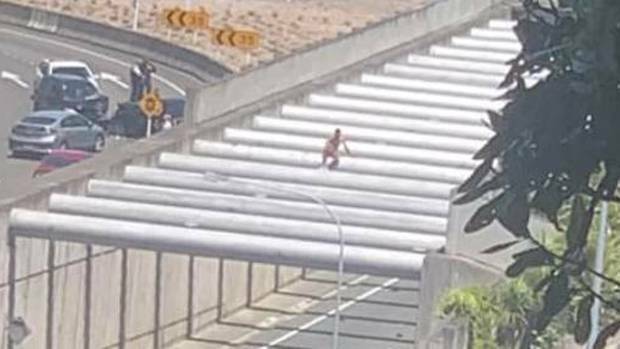 The man who scaled pipes above a Wellington motorway tunnel entrance on State Highway 1 has ended the 10-hour ordeal by coming down safely. A Stuff reporter at the scene said the man made his way down just before 10.30pm on Thursday after talking to someone he knew – not a police officer. Soon after he was taken away in a police car.